JULIO MARZAN | J. 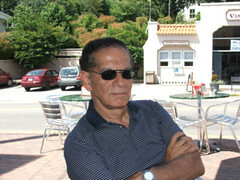 A. MARZAN writes poetry, fiction, and non-fiction. As poet he has published two books of poetry, one in English, Translations without Originals (I. Reed Books), and one in Spanish Puerta de Tierra. (U. of Puerto Rico Press) as well as poems translated for his Selected Poems: Luis Palés Matos (Arte Público Press, 2001) and in Inventing a Word: Twentieth-Century Puerto Rican Poetry. His poems have appeared in numerous journals, among them, Parnassus: Poetry in Review, The Massachusetts Review, Tin House, New Letters, and Harper’s Magazine. His poems have appeared in anthologies, and the following college texts: Literature: Reading to Write (2011), The Compact Bedford Introduction to Literature,( 1999-2007), Latino Boom: An Anthology of Latino Literature (Longman/Pearson, 2006), The Bedford Introduction to Poetry (1999). US: The Literature of a Multicultural Society, (McGraw-Hill, 1998), Literature: Reading, Reacting, Writing (Holt, Rinehart, 1991). Currently, two poems appear in the past four editions of The Bedford Introduction to Literature. n May, 2007 he was appointed by the Queens Borough President the fourth Poet Laureate of Queens (2007-2010). In later prose he began writing as J.A. Marzán to preclude any expectations of the subjects or style of his poetry. As fiction writer, he is the author of the novella-in-stories The Bonjour Gene (U. Wisconsin Press, 2005). Chapters of The Bonjour Gene had already appeared and been reprinted in journals and anthologies. He has recently completed his second novel. the fourth Poet Laureate of Queens, NYC (2007-2010).